It’s late. You’re home alone. The television’s on—a local station showing an old scary movie. The longer you watch, the more you wonder, “Did I lock the front door? ” Then you hear the floor creak behind you, and you’re not so sure that you’re alone after all. 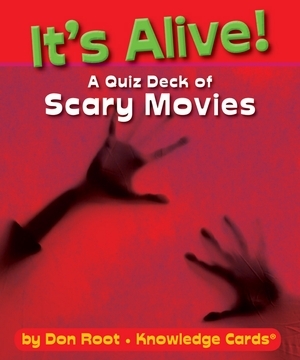 From aliens to psychos, this deck of 48 cards covers the most terrifying motion pictures ever made. Quiz yourself or your friends: the front of each card provides a hint, while the back identifies the movie and fills in loads of details. By the time you’re done, you’ll know much more about Hitchcock, Hooper, Craven, Cronenberg, Carpenter, Kubrick, and dozens of other masters of suspense.